Written and directed by J.C. Chandor this tautly wound script and story-telling style brings to mind a great play. Mostly due to the workman-like office settings, this enables Chandor and his merry bunch of talented actors to unfurl the story in a way unusual to film. That’s not to say it hasn’t been done before and brilliantly (12 Angry Men, Glengarry Glenross, All the President’s Men) but it’s rarely done well and often enough. The realistic, theatrical approach allows the protagonists of the piece, yet antagonists of the well-being of capitalist society, to be shown as humans, not merely some callous rogues that will probably end up dead or in jail. This is a film about capitalism, greed and how far it can be taken. Loosely based on the American financial crisis of 2008/9 it draws on, without being specific, the world of Goldman Sachs, the Lehmann Brothers and Bear Stearns. Using an un-named Wall Street investment company allows investigation of an event that was probably a long time coming. It manages to keep the stakes high and feel like this is how it could have probably went down. Eric Dale (Stanley Tucci) gets fired from a big investment firm as part of a major culling. The project he was working on before he was ejected from the building has implications too huge for the immediate bosses to see. He hands over a USB to one of his underlings, Peter Sullivan (Zachary Quinto), who stays behind to work on it, discovering information that requires him to call his boss late at night with the not so great news. And so the wheel begins to turn on an event that will have far-reaching effects on many, many lives. Jeremy Irons (John Tuld) reminds us of how great an actor he is playing the head of the un-named company and Sam Rogers (Kevin Spacey) has the moral dilemma at the forefront of his day/night and plays it brilliantly. Paul Bettany is very believable as a Londoner working with the big boys on Wall Street and Penn Badgely plays Zachary Quinto’s junior work mate well, as always. Thoroughly well supported by Simon Baker, Demi Moore, Mary McDonnell and Aasif Mandvi, all the actors here realise they are getting a chance to really act…on film. Clever dialogue, no histrionics, just great story-telling makes this an important film that deserves to be seen. 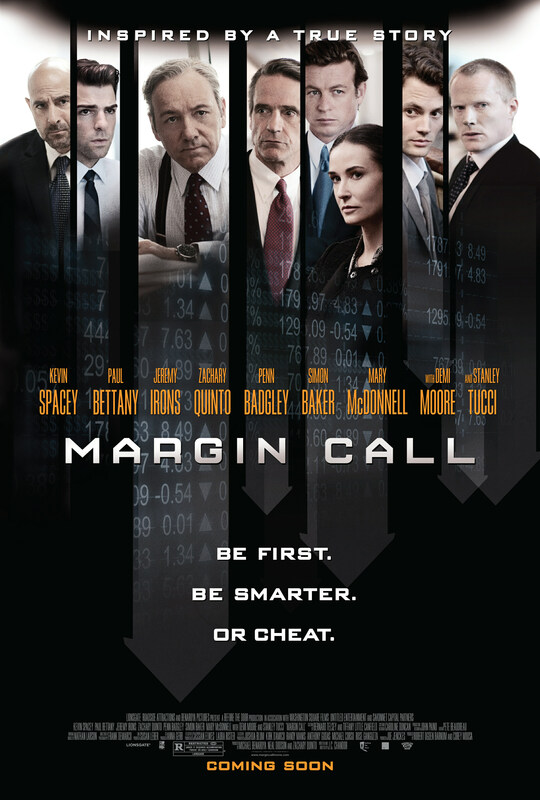 Margin Call was J.C.Chandor’s first film, as a director and writer on it he shows that he is a director to watch out for. A mark has been made. Now do I really have to watch All is Lost? There are times when you watch a film that you don’t find enjoyable but you know deep down that it is well made and all criticisms are totally linked to your own taste and are probably influenced by the mood you are in when watching it. What one thinks and feels today is more than likely to be different tomorrow or next week. Upon the first viewing of Michael Mann’s Heat I wasn’t impressed, the amount of anticipation about the De Niro/Pacino scene was heavy with the weight of expectancy and consequently this viewer was always going to be disappointed. A dear friend of mine persuaded me to rewatch it and now it ranks as a film I love and have seen it several times since and enjoyed it more each time. I wonder if I revisit The Past in ten years time will it have a much deeper impact. It has already won a number of awards and is deemed a critical success. Ahmad (Ali Mostaffa) returns from Iran to finalise his divorce to his French wife Marie (Berenice Bejo), who is now living with her new lover Samir (Tahar Rahim). His arrival sets off a chain of emotional events all linked to their shared past. It brings to mind the experience of watching the Romanian film, 4 Months, 3 Weeks and 2 Days, another film lauded with critical acclaim that was the opposite of entertaining or accessible. All films don’t have to be entertaining yet some still retain artistic merit. The Past is nowhere near as gruelling as 4 Months but was still a chore nevertheless. The acting is brilliant all round; Bejo, the best thing about The Artist, Rahim, utterly captivating in Un Prophete, and Ali Mostaffa all deliver excellent performances filled with depth and truth but it is hard to get on board emotionally when the way the story is told is so downbeat and lacking levity. The director, Asghar Farhad is clearly a talented film-maker who knows how to put his vision on the screen and his films have and will gain plaudits. I have yet to see A Separation but my desire has waned since seeing The Past. The slow pace is certainly a conscious choice on the part of the director and will definitely work for some people, definitely not the mass market; as a film, it maybe worthy of awards but my experience was one of dis-connectedness. Recently, I watched Blue Ruin, another brilliantly acted film that wasn’t very enjoyable but was also critically acclaimed. Each of us has our own tastes and preferences, usually moulded by our environment and our previous experience. Great; this is what makes us different and consequently, interesting and intriguing to each other. Both The Past and Blue Ruin have their place and deservedly so, it’s great that they have been made and for sure people will have been moved by them. Unfortunately, this viewer was not one.